Summer is finally here and with it comes the urge to get outside and spruce up that landscape. If you've been looking for things to do with that pile of old bricks, I've got a collection for you. So, if you've got a few bricks on hand (if you don't, now is the time to head over to the marketplace to find some) and you're wondering what to do with them all, just take a look at this collection. We guarantee that you'll find something that will help you to use up those old bricks, and spruce up your outdoors at the same time. 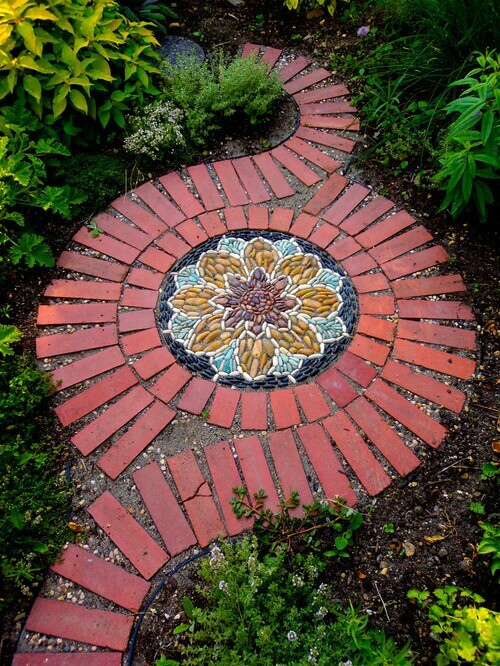 Those leftover bricks are perfect for creating a lovely informal walkway or path to your door. Or, use them to create a walking path through your flower garden, or anywhere you want to add a bit of rustic decor. The possibilities are endless, and making a walkway is much easier than you may think. This may be one of my favorite garden decorating ideas. By utilizing the holes that come in bricks, you can create these gorgeous planter/candleholders. Use the candle area to burn citronella candles during the summer months and cut down on your insect problem. Add succulents at the other end to give your entire garden a luxurious and elegant feel. Creating a beautiful garden bench from those leftover bricks is so much easier than you may think. I love the thought of making a circular bench around a fire pit, or you could just make a sectional type bench and have room for everyone. If you have an inground swimming pool, consider crafting a bench around one end. This one is a bit more complex and may take a little time, depending on the size of your garden. You will need to dig down a bit to place the bricks but just imagine how great it will look when you're finished. This edging idea is gorgeous and won't cost much at all if you already have a few bricks on hand. Okay, so maybe this one is my favorite. 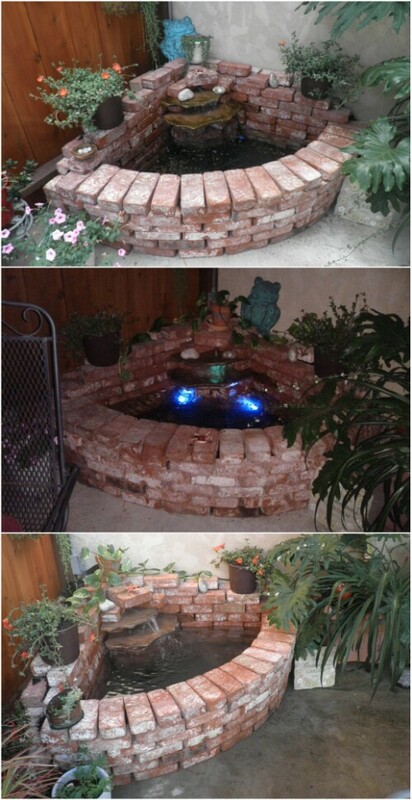 Can you imagine the beauty that this DIY brick waterfall will bring to your home? And you'll be absolutely amazed at how easy it can be to build. You could also do this near a small pond or put it by the pool. I love it right there on the patio, though. 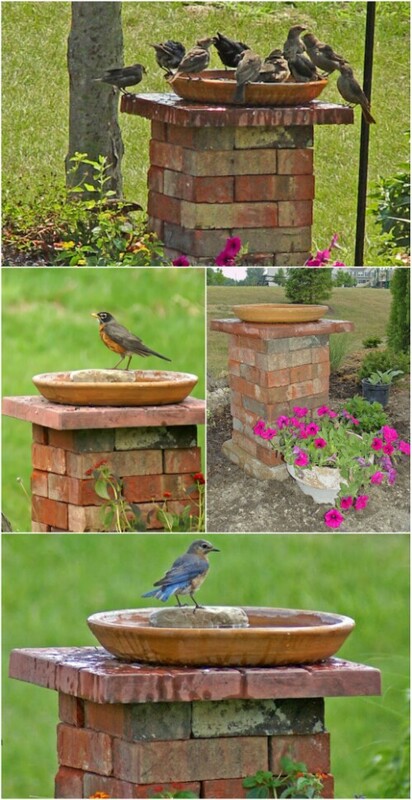 Use those leftover bricks to create a stunning birdbath stand in your yard or garden. This one is really easy, too. You just stack the bricks on top of each other, in whatever height or width you want, and make sure that you "glue" them together. This is a great place to add a large bowl for a birdbath. Get the kids in on this project. I guarantee they'll love it! 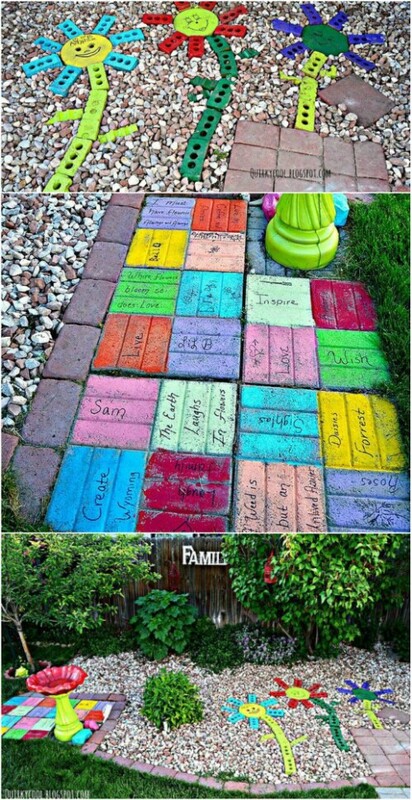 Let the kids help you paint your bricks, and then use them to create a walkway in your garden, or from the driveway to the house. You can use a combination of colors, make it rainbow like, or stick with colors that best complement your house. Add some motivational quotes or words and you're all set. This is a bit different than the edging idea above. This one mixes gravel and creates a stunning design that is sure to raise your property value and impress the neighbors. You just mark off the walking path, use your bricks in a staggered arrangement, and then fill in the middle with pea gravel. 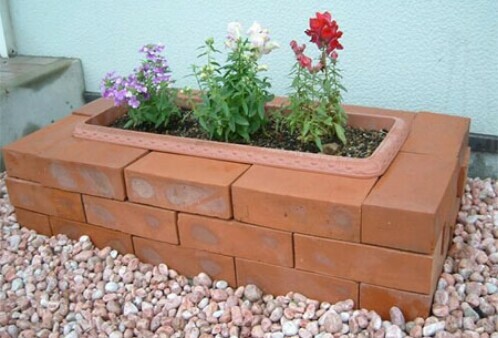 This also helps to hold your gravel in place and keep it from spilling into your flower beds and lawn. This DIY brick herb spiral is a great project for smaller yards, but you can use it in larger areas as well. The spiral look is fascinating, and it gives you so much more space to plant all of the herbs that you want. If you aren't really into growing your own herbs, you can also use this as a flower bed for flowers that don't need to root too deeply. 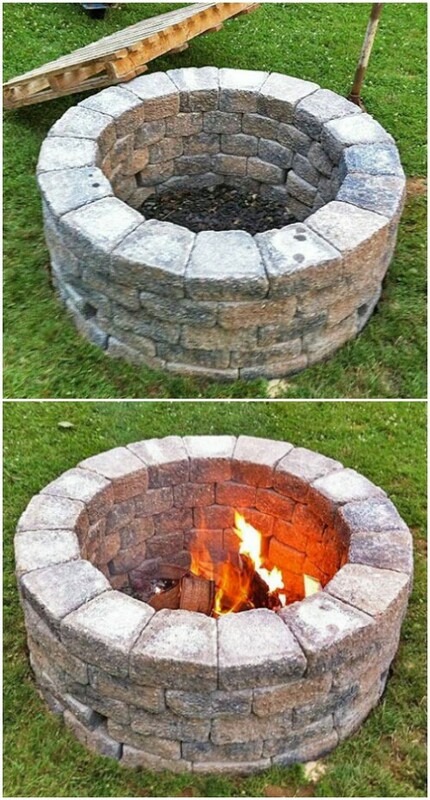 I've shown you different fire pits in the past, but this one may very well be among the easiest to create. 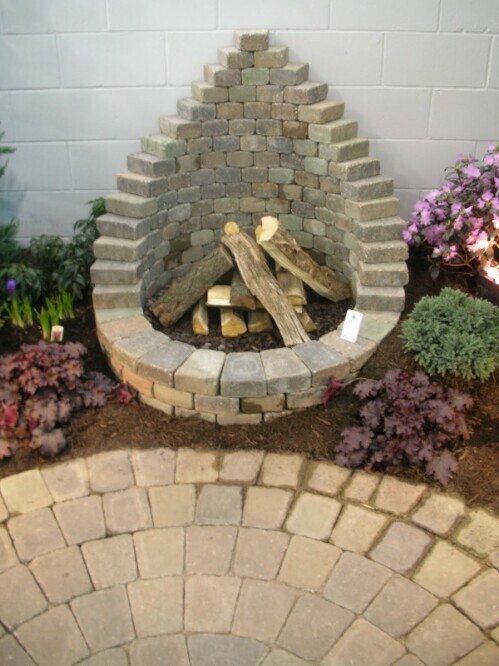 Put those recycled bricks to good use and create a fire pit where you can relax the night away. This project doesn't require anything but bricks, and it's a much easier project than you may think. These aren't any books that you're going to read, but if you're a fan of the written word, these brick books are the perfect garden decoration. 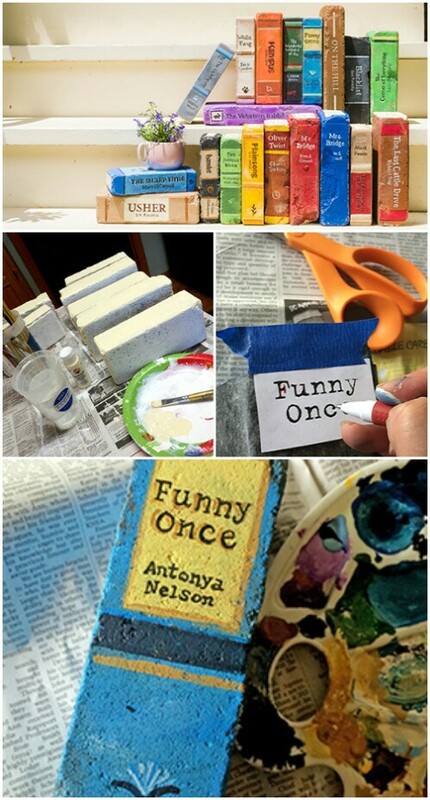 You just paint the side of the bricks to look like books and then add your favorite book titles or authors. What a neat idea for bookworms or to add a bit of charm to your favorite outdoor reading area. Stack those bricks up around the base of your favorite tree, and you've put them to good use and decorated your lawn at the same time. You can then fill in the area between the bricks and the tree with potting soil and add flowers or succulents to really create a great look. 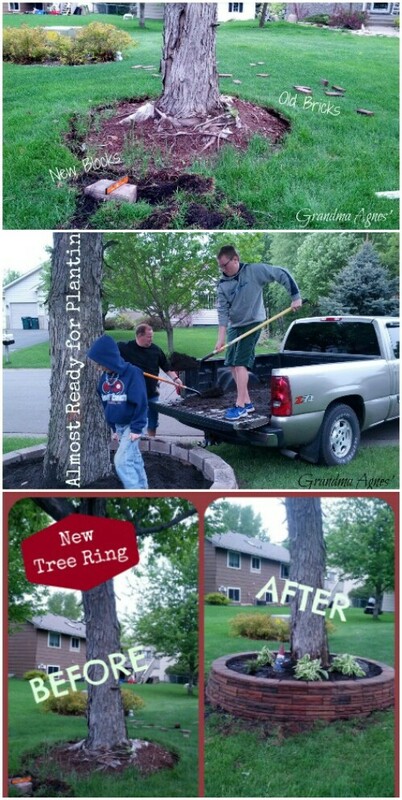 Do this with all of your larger trees. 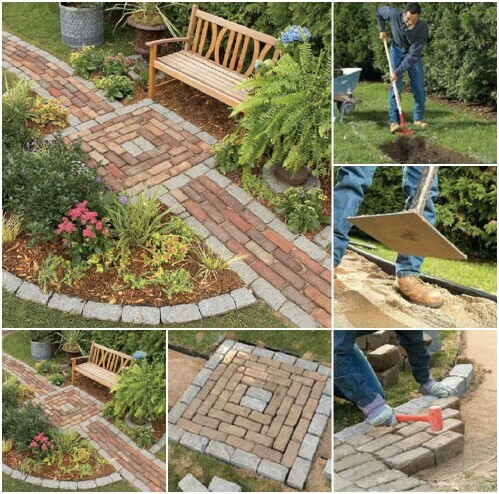 Upgrade your side yard with those old bricks. If you have a smaller yard on the side, and you don't want to mow a narrow strip of grass, create this great brick walkway and give it an updated look. This will take a bit of time so clear up a weekend. Once you’re finished though, no more worries of mowing or weeding that small side yard and you've got a gorgeous display area for plants and flowers. 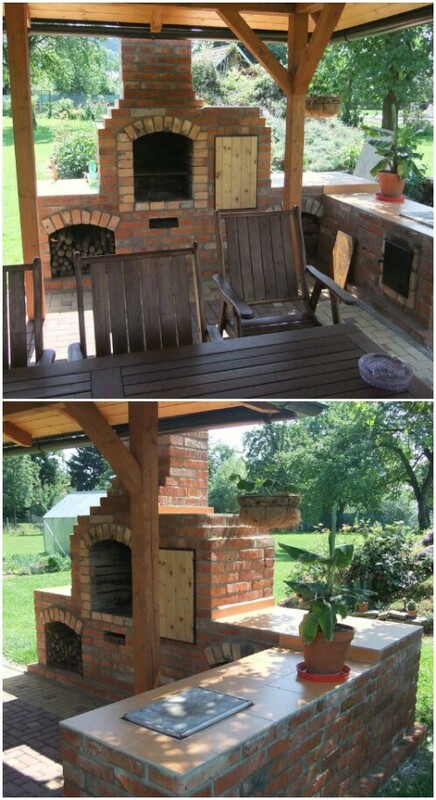 Whether you love sitting by a warm fireplace on a chilly fall evening or you really want to grill up a storm during the summer, this combination fireplace and grill is perfect. This one will also take a few days, but it will be well worth it in the end. You will need several bricks as well, and a few other supplies so make sure you have everything ready when you begin. You don't need anything special to create these great DIY raised planters. Just stack the bricks, and place your planters inside. You can do these in any size or shape, and what's great is that you don't really "glue" them together, so you can disassemble them and reassemble as needed. 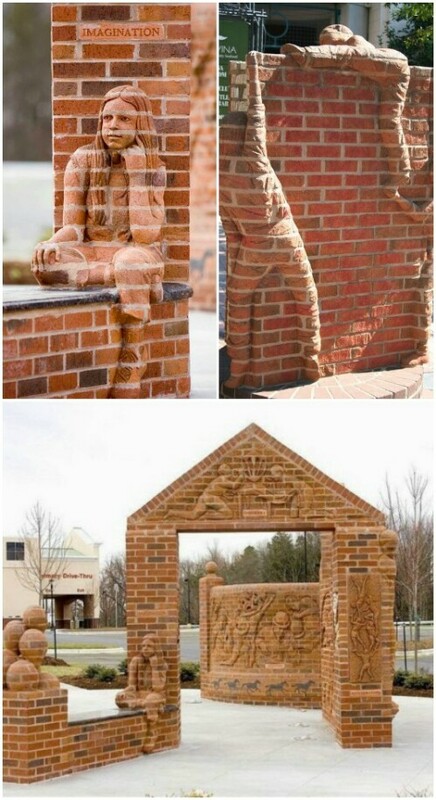 The artist in you really wants to create this amazing brick sculpture. While these sculptures were done by a professional, you can easily recreate some of the scenes that he's done and make your own gorgeous statue out of those bricks. Put them to good use by recycling and turning them into an amazing piece of yard art. Using a galvanized steel tub and those leftover bricks, you can add charm and beauty to your yard by creating a natural pond. Plant aquatic plants and really make it stand out. This is such an easy project, and you can use smaller tubs to create a few smaller ponds if you prefer, and then plant gorgeous greenery between them. You don't have to spend all day digging to create a brick fire pit. You can actually just stack those landscaping pavers or bricks up and create a nice fire pit next to the house or on the deck. 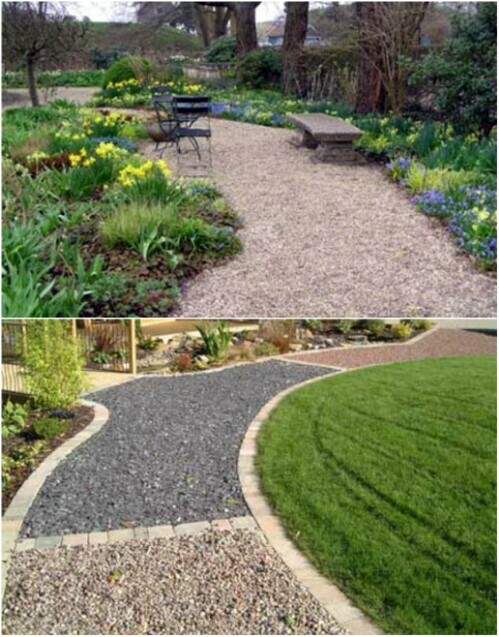 Be creative and give it a unique look that will really make your landscaping stand out. 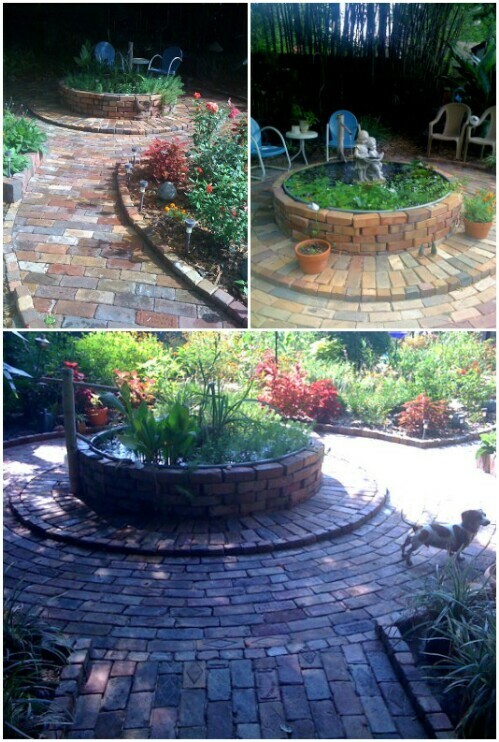 Pathways are certainly a great way to use old bricks, and this creative and gorgeous pathway can easily be made in a weekend. Think about your design before you begin. Draw out what you want and then you'll have a good base for your creation. Don't just go with the flow. Let your imagination run wild and build a walkway that is sure to impress everyone who visits your home. 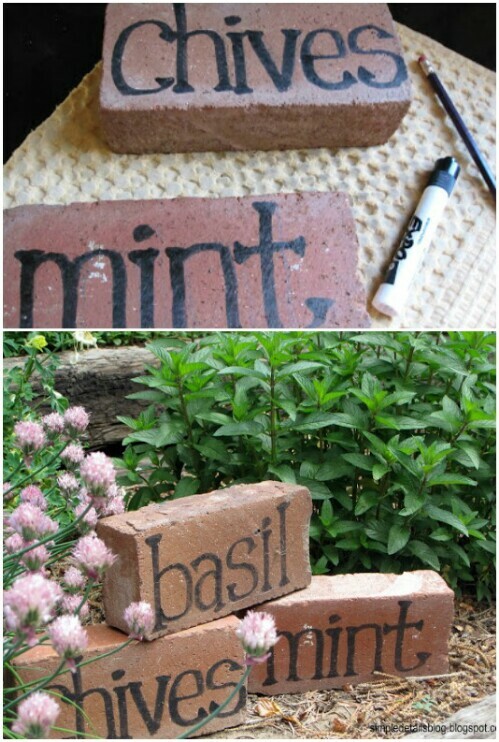 Whether you're planning an herb garden or need your flower bed spruced up, these garden markers made from bricks are perfect, and they're really easy. You literally just take a Sharpie and write on the bricks what you need them to say. You can use colored Sharpies if you want, to give your herb garden a bit of flair. Use stencils or freehand it, whatever you prefer.